"Getting excited yet?" Take a look at this. Thanks to a post by AICN's Eric Vespe on Facebook, there seems to be a new (likely officially released) Japanese poster for Peter Jackson's The Hobbit: An Unexpected Journey, hitting theaters in less than 3 weeks. 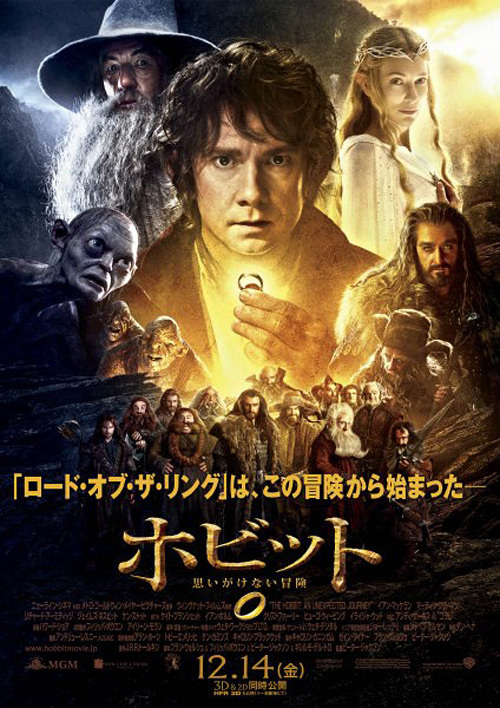 It was posted on TheOneRing's Google+ and via Facebook user Simon Boudreau, and looks to be an official Japanese one-sheet for The Hobbit, with a new epic-style Lord of the Rings-like design featuring all the main characters, including Gollum, Gandalf and Thorin, even Galadriel, all posed around Bilbo Baggins holding the ring up. Simon's post sums up the excitement: "The smallest character [in the] history of cinema will probably bring one the biggest movie ever this December." In case anyone is wondering, the tagline translates to "the Lord of the Rings began with this journey"
I assumed the Japanese title was something like "Many Little Men And A Wizard In Giant Cash-Grab Super Happy Adventure Time"
no - this is just movies based on the prequel book to LotR. a cash grab is 3 iron man movies, multiple avengers/batman/superman movies; multiple xmen movies; far too many spiderman movies; the 3 future avatar sequels - THOSE are cash grabs. but why not - although i'd like new ideas rather than relentless sequels (or remakes), this is what makes the money and hollywood is trying to do just that. "Can this look anymore like LotR Fellowship of the ring?" if even galadriel is there, where is elrond? The poster in the article has too much contrast and saturation which gave me a negative impression. The one on facebook is great though. What a boring, cliché poster. Nothing epic about it. My exact thought was "Oh. Epic." yawn. Orange/yellow and blue. The official colors of the movies.